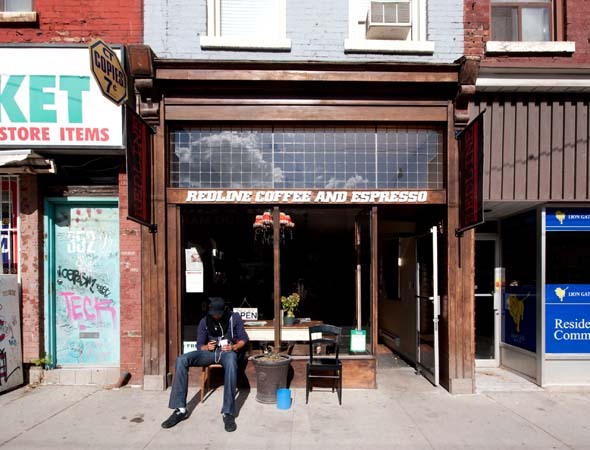 Redline Coffee and Espresso at the corner of Queen and Parliament in Toronto's east end is a breath of fresh air for this part of Corktown , but still needs a bit of work before it has Toronto's espresso heads lining up for shots daily. Previously a Savoury Grounds , Redline is now owned by Julie Van Der Lugt who took over the space earlier this year and has kept much of the same geometry, but injected a healthy dose of colour, has plenty of art by local artists on the walls and has built up the shop using completely second-hand materials. To Van Der Lugt, locality is important and she makes all of her second-hand purchases in the neighbourhood. The coffee is roasted locally, and Circles and Squares , a popular bakery among indie cafes in Toronto is where she sources her food. Currently, Van Der Lugt is working with a Toronto-based chef to create a sandwich menu to add some more food to the shop's offerings. The name Redline comes from the constant stream of streetcars going by the shop during the day, and I happen to think this is one of the coolest and most uniquely-Toronto names I've seen for a cafe. Upon walking into the space, the art on the walls is the first thing to catch my eye. 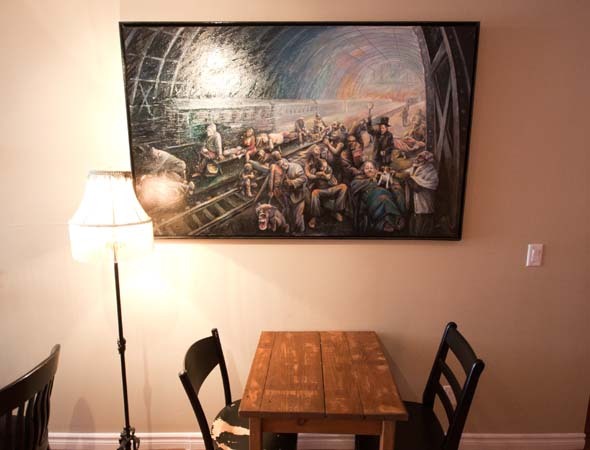 Large canvases of brightly-coloured paintings line the wall to the back of the store and out to the patio. 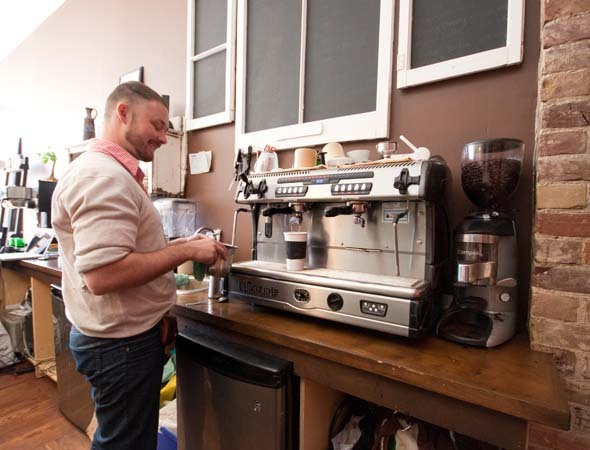 On the counter are brew systems, a small food stand and an old Italian espresso machine. The first thing I ordered was a single shot of espresso which came out way too hot and was slightly sour. Despite the way it tasted, the shot did have a nice head of crema, with a decent amount of tiger striping, which is why I dove into tasting this shot so hastily in the first place. Next, I ordered a cappuccino, which was slightly better, but still not great. Served in a whopping 12 oz. cup, my cappuccino tasted as though the shot used was pulled too long, and gave the giant cappuccino a slightly watery taste. Also, the 12 oz. cup, which is almost 1/3 larger (or more) than the size I'm used to, made it hard to evaluate this drink as a cappuccino, as the way it was prepared made it taste like more of a latte. The best part of this cafe is the space. High ceilings, deep red paint on the walls, carefully-chosen second-hand furniture, and a patio out back make this place a destination for those looking to get cozy and cuddle up with a newspaper in an unmistakeably independent space. 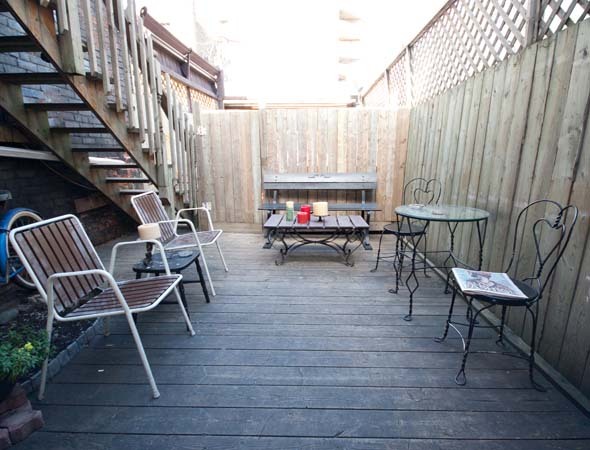 A back patio in any cafe has a special spot in my heart- especially those in busy areas of the city. It's so nice to be able to sit outside, away from noisy and invasive traffic and just enjoy a coffee. For Van Der Lugt, creating a neighbourhood destination with the environment in mind is a prime directive, and Redline espresso and coffee bar is well on its way to becoming that space. But the espresso system needs to be improved before it can service a coffee crowd. 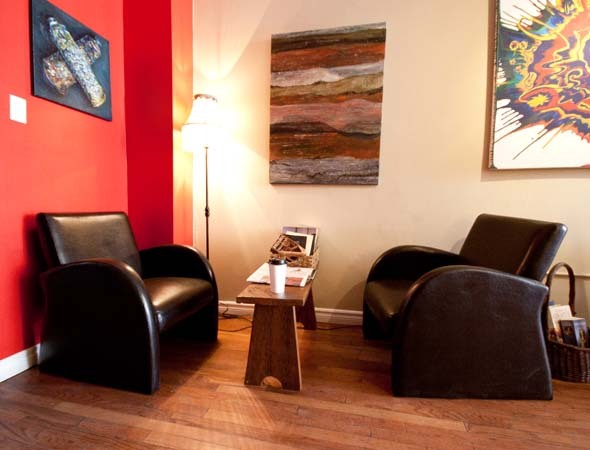 Already, Redline has hosted a number of events for groups in the neighbourhood. So far there has been a VQA wine tasting, private parties and an independent film screening. My overall impressions: A cool space with a local focus, and a taste for second-hand design. 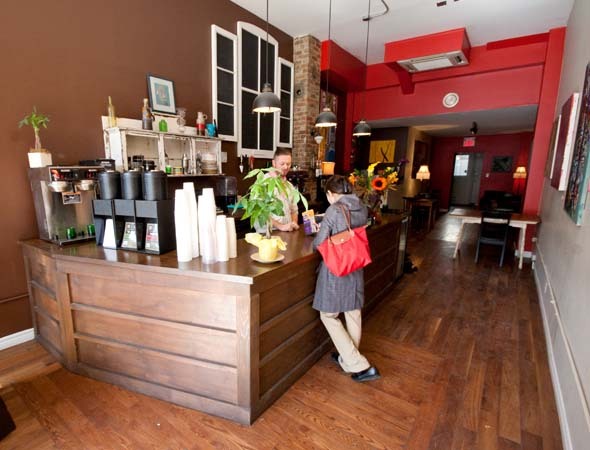 Go for the atmosphere and friendly owner, but don't expect much in terms of coffee.